One of Dmitry Balyasny’s quants, Paul Chambers, is leaving the firm for his old fund, Man Group, less than two years after joining, sources tell Business Insider. Chambers, who joined the manager at the end of 2017, spent roughly a decade at Man Group before joining Balyasny’s London office. Balyasny has replenished its portfolio manager ranks after firing a fifth of staff at the end of a disappointing 2018. It’s hired 10 new money managers since the beginning of the year, but has also lost Justin Dodd, one of its top risk-takers, to Citadel. Balyasny is losing one of its quants, Paul Chambers, who joined less than two years ago, sources tell Business Insider. Chambers is returning to his old shop, $US112 billion Man Group, where he spent nearly a decade at before joining Balyasny’s London office at the end of 2017. At Balyasny, Chambers worked under Ulrich Brandt-Pollmann, the firm’s head of quant, and he and Brandt-Pollmann co-led the equity strategy within the systematic team at Balyasny. Balyasny and Man Group declined to comment. A source familiar with Balyasny’s thinking said the equity strategy Chambers co-ran will continue despite his departure. Chambers was a part of a hiring spree by Balyasny in London. Filings show that Balyasny went from 69 employees in London at the end of 2016 to 92 employees 12 months later. At the end of a disappointing 2018, during which founder Dmitry Balyasny sent an email to staff saying “we are getting our butts kicked,” the manager then cut staff by a fifth, as investor redemptions pushed assets down to roughly $US7 billion. The firm has begun to build its portfolio management teams back up after the layoffs, telling investors earlier this month that they had hired 10 new portfolio managers, including six from Citadel. The firm has also added a two junior quants to its nearly 20-person systematic team, a source close to Balyasny said. Citadel however has recruited over one of Balyasny’s portfolio managers, Justin Dodd, this year. Chambers worked for Man Group’s quant unit AHL from 2009 to the end of 2017, rising as high as partner and head of equities for the unit. Prior to that, he worked in London for a South African-based insurance company, Old Mutual, as a quant developer. Quants have become some of the most sought-after talent in the industry as Wall Street and Silicon Valley battle for the top data scientists and coders. 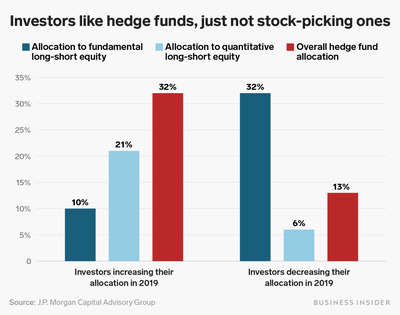 Even as interest in traditional stock-picking strategies has waned, investors are still diving into computer-driven strategies, surveys have shown.